Imperial produced a plethora of plain paneled types of patterns. One that isn’t seen or identified too often is the #393 pattern, which, depending on the size of the piece, has an additional identifying number following the #393. In early advertising, this was claimed to be a highly polished, low priced Colonial glass. Highly polished would refer to the radium type finish that I have observed on all those #393 pieces that I have seen. The first piece in this pattern that we found is our two-piece punch bowl or fruit bowl. We found it locally. It is marigold and both the base and top are ruffled. At the narrowest the bowl is nine inches and at the widest, twelve inches. These punch bowls may be found in marigold and green. The bases on the sets can be found either ruffled or non-ruffled. 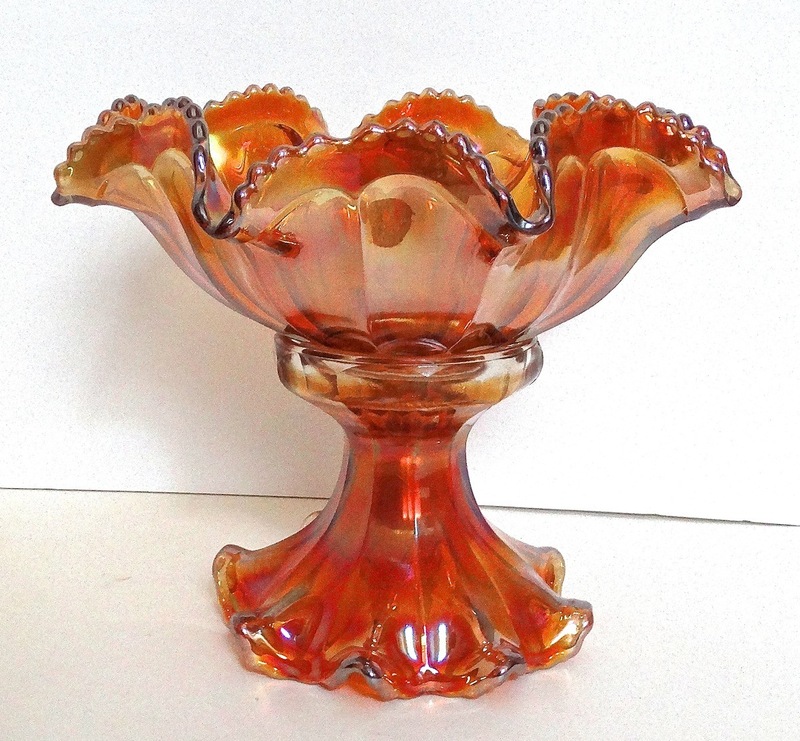 On Carnival Glass 101, a punch set in “amber tones” is pictured. I don’t know if this refers to the color of the glass or just the iridescent look. There are cups available in marigold and green as well, but these are extremely hard to find to finish a punch bowl set. Marigold would be found more frequently than green. Other than the punch sets, bowls of varying sizes are also found. Dave Doty, on his internet site, has no listings other than the punch sets. This probably stems from the fact that auctioneers rarely list the small bowls, and also group them into box lots. They are available in a four-inch unruffled which would be #3934 1/2. These small bowls may also be found in a ruffled version which is #3935 1/2, and seven and one-half inch and eight and one-half inch bowls—#3937 1/2 and #3938 1/2. As with the punch sets, these varying sized bowls are found in both marigold and green. The advertising also listed #3939 1/2 as an orange bowl, which I believe is the same as our punch bowl. This was advertised as found with or without a “foot” or base. You may wonder why there is a number 1/2 after each of the production numbers. This referred to the fact that these were utilitarian ware. I would imagine that these would be for those of us with less disposable cash who still wanted beautiful serving pieces. Also, it was expected that these would be frequently used. One small five and one-half inch berry bowl is known in a very translucent blue, not cobalt blue nor ice blue, but a beautiful light blue shade with beautiful iridescence. I haven’t seen an amethyst one, but it was listed as available on the Fry’s website. One other very rarely seen item in this Colonial Variant #393 line is the water pitcher, numbered #393 followed by the number 1/2/27 in early catalogs. 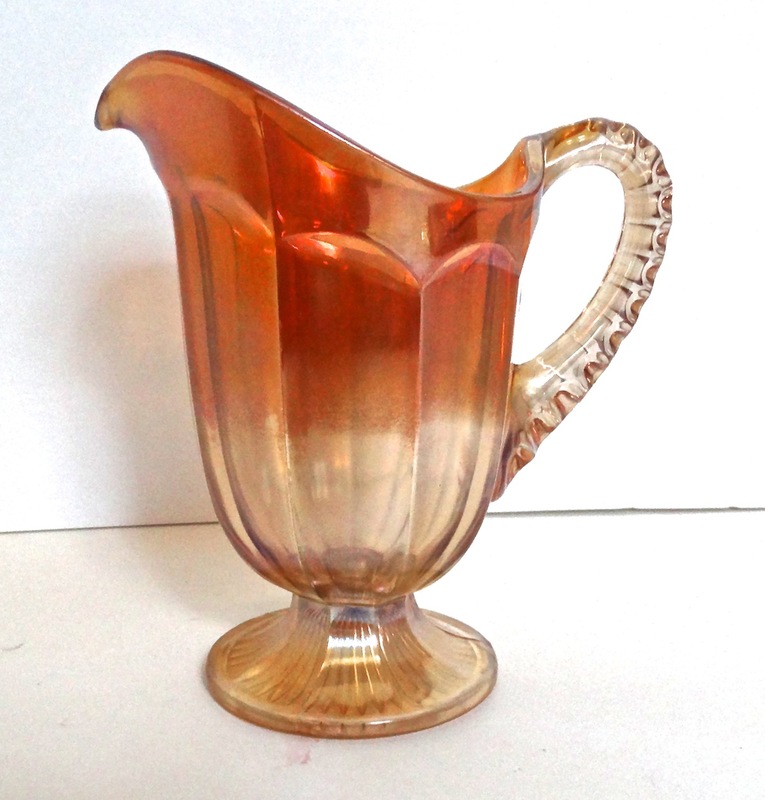 The pitcher has an elegant look with a footed base. We found one in a somewhat local antique mall. It had no tumblers. The Frys won their water set, with Imperial Flute #4 tumblers, at a Burns auction. I have not seen nor heard of another. I’m sure there are others somewhere. The #4 tumbler is very similar to the #2 tumbler, but #4 has a shorter band at the top and measures four inches. The #2 tumbler is closer to five inches and has no star in the base. Both the #393 pitcher and the #4 tumbler have matching star bases. The base on the tumbler is factory ground. These pitchers and tumblers are only known in marigold at this time. As many of our favorite carnival glass companies did, Imperial made these molds to use to produce clear pattern glass before putting them into carnival glass production.